Message from Our CEO | UMN Pharma Inc.
Today, on February 14, 2019, we have announced the results for the fiscal year 2018. First of all, we have summarized what we would like to announce in terms of this financial results and future prospects. The business partnership based on the capital and business alliance (hereinafter referred to as “capital and business alliance”) with Shionogi & Co., Ltd. (hereinafter referred to as “Shionogi”) entered into on October 31, 2017 has been proceeding as planned. Also we have achieved 102 million yen of net sales as planned for the fiscal year 2018 as announced on January 22, 2019, “Notice on Revision of Earnings Estimates”. Even at each profit stage, we landed at mostly the same results as the above “Notice on Revision of Earnings Estimates” or a decrease of 197 million yen of operating loss and a decrease of 82 million yen of net loss comparing from the initial forecast announced on February 14, 2018. In terms of net assets, as announced on October 31, 2018, net assets was 382 million yen and maintained almost at the same level as the end of the fiscal year 2017, 357 million yen of net assets since a partial conversion of CB was realized, as originally expected, allocated to Shionogi. The Shionogi’s shareholding ratio of our stock after the conversion was 20.27% or 3,100 thousand shares so that Shionogi was positioned as a “major shareholder” and an “other affiliated company” for us. Through this capital and business alliance, we continue to be committed to our business together, not only to strengthen our medium- to long-term strategic partnership, but also to improve our corporate value. 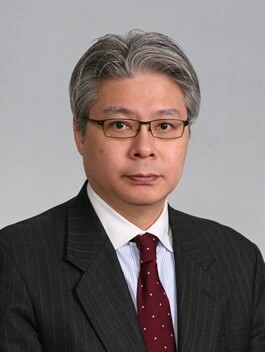 In addition, we believe that Shionogi will be a stable long-term shareholder that will contribute to our management stabilization, as capital and business alliance has a clause that the shares owned by Shionogi cannot be sold without the prior consent of us as long as the capital and business alliance continues. Based on the above results, under closer cooperation of the two companies, we have been considering moving forward the preparatory work earlier than initial plan for the transition to the second phase that was initially planned to enter into during the fiscal year 2019. Through a consultation about the transition, we set our greatest goal to maximize corporate value in the alliance with Shionogi. We believe that building a medium- to long-term win-win relationship with Shionogi, which take advantages of both strengths of Shionogi and us, will be able to lead directly to maximizing corporate value for us. By transition to the second phase, we will place the fiscal year 2019 as “The first year of full-scale development”, and we will implement the necessary measures under the recognition that we will enter a new stage. Next, we would like to explain the details of the business progress. As the first phase based on the capital and business alliance by promoting development of fundamental core technology and basic research of development candidates, we have set as our business policy in our next-generation biopharmaceutical in-house development business. We have been advancing to create “Next-generation logical vaccine” aiming at achieving high efficacy and high productivity by integrating peripheral technology, such as adjuvants, preparations, and devices. In addition, we re-organized existing partnership and we have been promoting research & development, setting new development pipelines, such as Recombinant seasonal influenza HA vaccine (UMN-101), Recombinant H1N1 influenza HA vaccine (UMN-102), Recombinant Rotavirus single vaccine (UMN-103), and Recombinant Norovirus single vaccine (UMN-104). 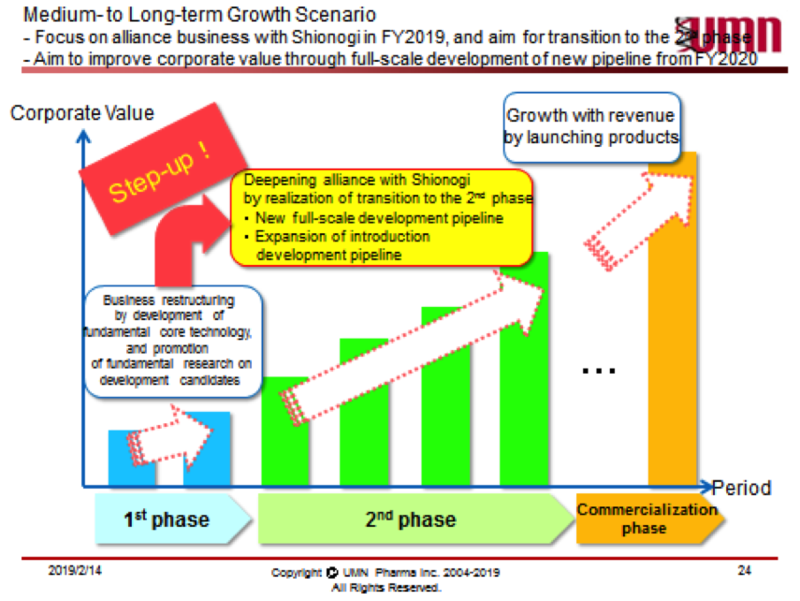 Regarding development of core technology, we have achieved 103 million yen of net sales as planed in the fiscal year 2018 in our next-generation biopharmaceutical in-house development business in the fiscal year 2018, based on this capital and business alliance, by achieving the first and second milestones set semiannually although we have not disclosed the details yet. In addition, through the joint research related to new adjuvants with National Institutes of Biomedical Innovation, Health and Nutrition (hereinafter referred to as “NIBIOHN”), as disclosed on June 26, 2017 and on December 1, 2017, we have been promoting research and development activities aiming at acquiring new adjuvants technology and formulation technology. As the results, by combining adjuvants with drug/drug delivery technology in multiple proprietary pipelines, we are producing certain results for the creation of next-generation logical vaccine. Regarding the selection of development candidates, we are also working to narrow down while responding to intellectual property rights based on the assumption of specific commercialization. In addition, we are discussing priorities, considerations for selecting the final formulation, and development plan with Shionogi. Considering the progress of the above development of fundamental core technology, Shionogi and we are reviewing to start preparation work for the transition to the second phase ahead of initial schedule, although it is planned to start during the fiscal year of 2019. We will prepare for transition of the second phase earlier than original schedule to move to the second phase at an early point and aim to shift to full-scale development by pipelined selected development candidates as development products. In the contract manufacturing business for biopharmaceuticals, we have recorded net sales from two cases of manufacturing consignment in the first quarter of 2018. There is no order after that, however, we will continue to accept orders that will contribute to the capital and business alliance with Shionogi. On the financial aspect, we maintained positive net assets as of the end of December 2018 as much as at the end of December 2017. We will continue to commit the progress of research & development schedule in the fiscal year 2019 as a top priority to achieve steadily the third and fourth milestones. We will also continue to make every effort to ensure business progress, aiming to maintain positive net assets by completion of conversion of CB balance until the end of December 2019. From the fiscal year 2018 to 2019, it is the first phase of the capital and business alliance, and as rebuilding business by development of fundamental core technology, and the basic research on development candidates, in order to develop, apply and launch next-generation logical vaccine, we will decide items to progress full-scale development. We will advance to the second phase of this capital and business alliances, when judging that certain results have been obtained for fundamental core technology, and we are assuming that the stage will be during 2019. In the second phase, we will cooperatively promote development, application, and launch, after the GLP examination, as development pipelines from actually determined items by basic research. Finally, I would like to explain the prospect of the fiscal year 2019 and business directions. As already announced, we are considering for commencement of consultation with Shionogi so that we can proceed to the second phase earlier than originally assumed. Our significant goal is to maximize corporate value in alliance with Shionogi, and we believe that establishing a medium- to long-term win-win relationship that take advantages of both companies’ strengths will lead directly to maximizing our corporate value, and we will discuss with Shionogi to shift the second phase. In terms of the prospect for the fiscal year 2019, as a result of conservatively estimated, it is a sales plan based on only the third and fourth milestones related to the achievement of the first phase. In addition, R&D expenses and general administration expenses are also on the premise of expenses necessary for achieving the milestones in the first phase. As a result, R&D expenses etc. will increase than that of the fiscal year 2018, so net loss is expected to increase. On the other hand, after starting discussion for the second phase at an early stage, by establishing a new framework based on exclusive license agreement regarding development and launch of pipelines, and collaboration in other forms, and by entering into agreements, we will aim to improve the profit and loss through adding net sales although it is due to contents of the second phase, alliance scheme, and economic conditions, etc. In addition, we believe that we will be able to show medium- to long- term management plan at an appropriate time after realization of the shift to the second phase. We will advance this capital and business alliance as planned and enter into the second phase earlier than initially plan so that we will promote research and development under business policy that the fiscal year 2019 is positioned as the first year for full-scale development business”. To promote R&D and successful business, we will achieve steadily the third and fourth milestones, selection of development pipeline, and agreement of the transition to the second phase. In addition, as a souse of the medium- to long-term growth, in order to deepen, to apply and to expand development of fundamental core technology, and in order to advance development pipeline’s portfolio, we will advance to strengthen the medium- to long-term financial base, and to expand and train necessary R&D human resources. We appreciate your continued support and understanding in the future.